The automatic pedestrian detection and emergency braking system warn you of obstacles to the front or the rear of the SUV. In the event that the system detects danger, the brakes automatically apply to avoid a collision. The blind spot detection and cross traffic systems alert drivers in the event of unseen hazards when backing up. Drivers receive an audio/visual warning should they accidentally veer into the wrong lane. 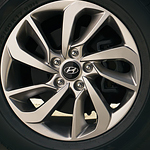 Learn more about the Tucson's safety and technological features at Fox Hyundai. Treat yourself to a test drive of the new Hyundai SUVs today.